In his enigmatically titled new book, Something Like a Nest, photographer Andy Sewell engages in a poetic re-framing – both literal and metaphorical – of the English countryside. Employing a subtle and contemplative pictorial style, the book addresses aspects of rural life and living beyond that which is superficially dramatic or stereotypical. 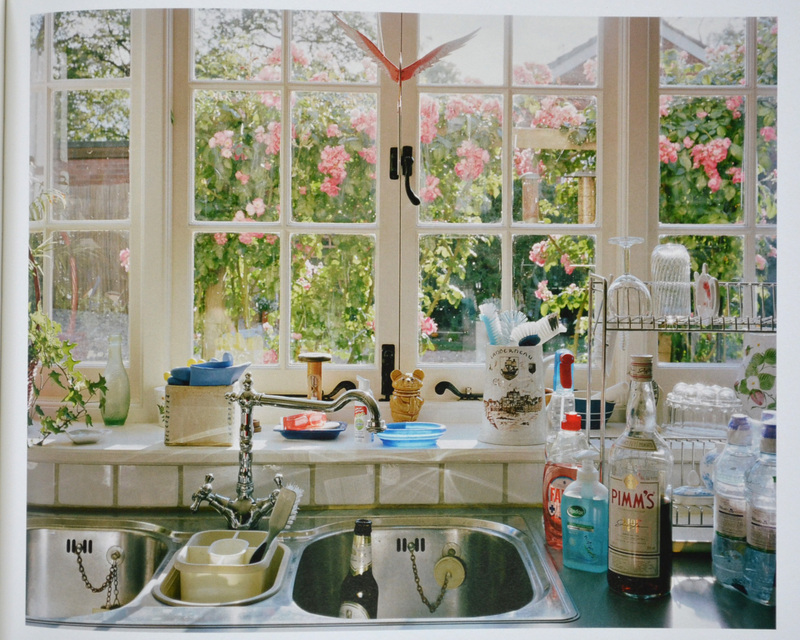 Sewell’s is not a search for his own sanctuary amongst the common detritus of agricultural production and country life, but rather as a collector of small stories, and motifs, which allude in an oblique way, to their own unique narrative vignettes. The overall effect is not to define what the English Countryside is and what happens there necessarily, but to open up possibilities and connections between disparate aspects contained therein. The simple act of noticing (as mundane as that sounds), or put another way, of understanding the reason for noticing, plays an important thematic role in the book. 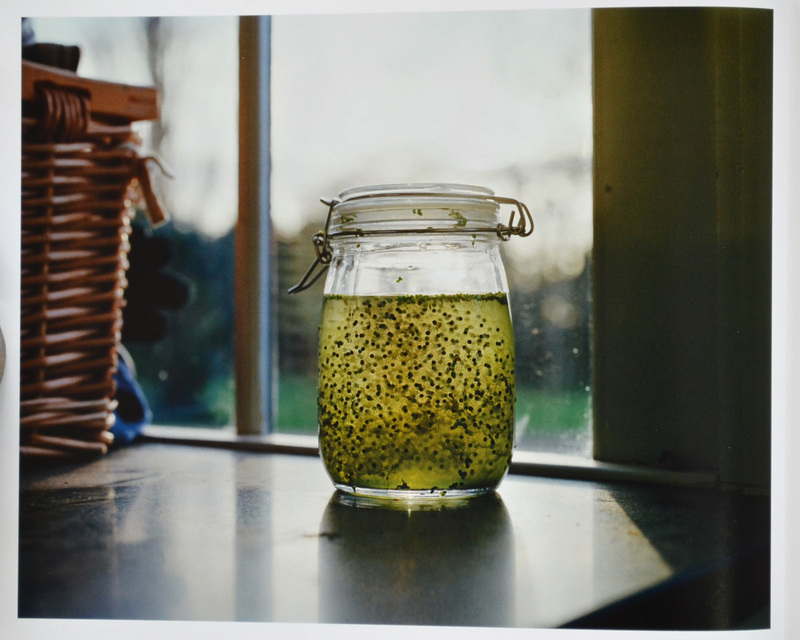 The third image, for example, depicts a still life of a jar containing what can only be described as a glutinous mass of frogspawn. Hermetically sealed in their iridescent enclave, the spawn seem safe and secure, like a new type of Kiwi jam from Waitrose, perhaps, with the label carefully peeled to reveal the tempting fruits behind. Yet, on a second look – second thought more appropriately – this is a precarious position for the entrapped embryos. The day could quickly turn from overcast and cool, to harsh and hot, boiling the life out of this primordial preserve. Another still life also alludes, more subtly, to containment. This time a carton (cartoon?) 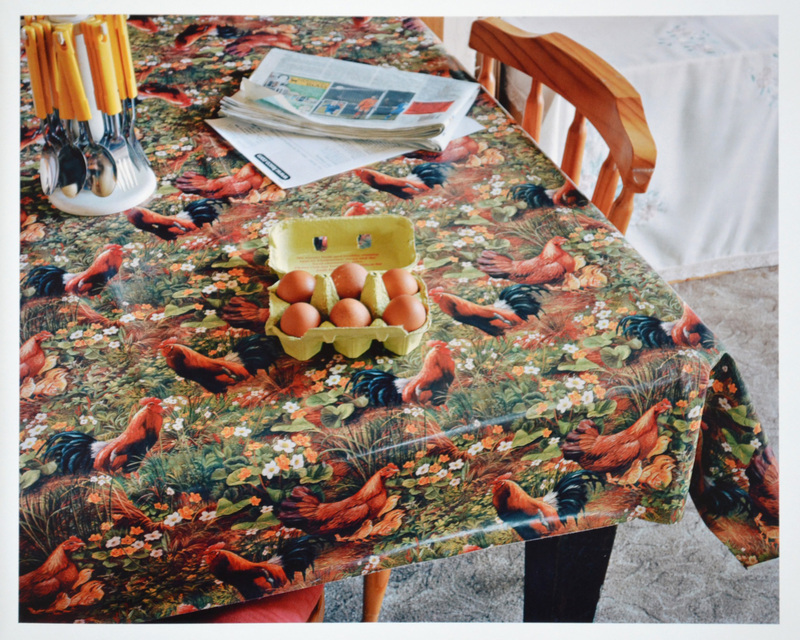 of eggs is placed on a cloth-covered table illustrated with kitsch depictions of cockerels and hens. This stylized ‘wipe-clean’ version of nature – resplendent with repetitious, almost robotic looking roosters – cleverly negotiates a dialogue between the natural world and consumerism; between the rural environment and our manipulation of it. In this context, the letter lurking in the background from Tesco.com takes on somewhat Orwellian connotations. The cutlery clamouring in the corner – normally benign utensils clad as they are in sunny yellow – are now made lurid, adding a further tinge of artificiality. This rubberized ‘cartooncloth’ adds to a sense of a reality somewhat skewed. Or is it perhaps a sense of the awareness of the photographer, somehow heightened? Either way, Sewell seems to celebrate rather than chastise these eccentricities, taking aesthetic pleasure in agricultural geometry and a keen eye for the significance in the minute and the mundane. Two years ago I spent some time walking the route of the proposed HS2 rail line between London and Birmingham. Although that area of the Buckinghamshire countryside is designated an ‘Area of Outstanding Natural Beauty’, the land is visually and ecologically better described as a kind of green desert. Modern farming techniques turn nature into a monoculture fit for little, save for the very specific task of growing crops. 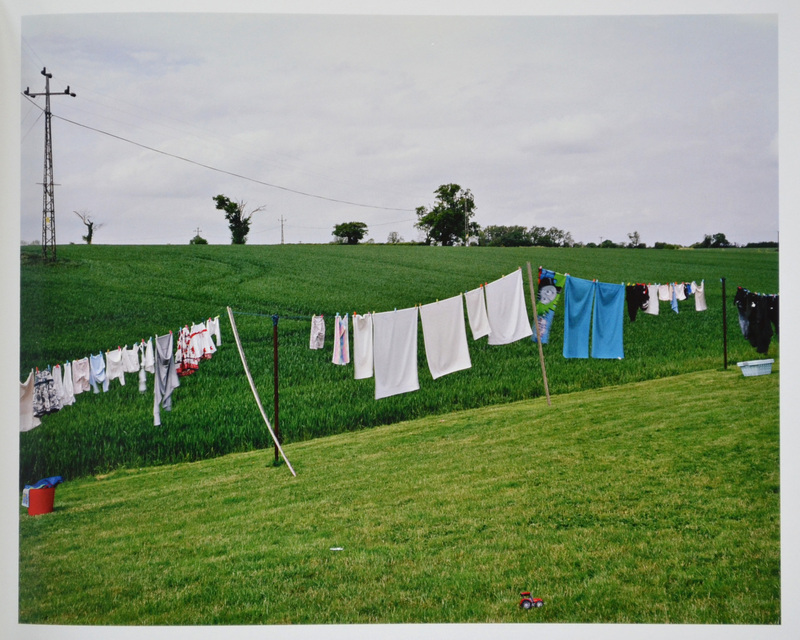 In Sewell’s green desert, the washing line draped across the middle of the frame includes a Thomas the Tank Engine towel, playfully illustrating the precariousness of this symbolic rural retreat. In the foreground, a shrunken toy tractor seems the victim of some kind of agro-chemical blunder. Elsewhere in the book, the colour red and the people who do appear, play an equally emblematic, unifying role, as do the five kitchen windows, resplendently back-lit with jewel-like ornaments and emerald green (radioactive?) washing up liquid. Religion appears as a metaphorical backdrop, and rituals are represented throughout, adding to the sense that repetition and renewal are key features of this unsentimental and complex vision of rural life. The image on the front of the book reflects this too, showing the desiccated remains of a cornfield, and it is encased, like frequent objects in much of Sewell’s English landscape, in a thin and beautiful veneer of plastic.